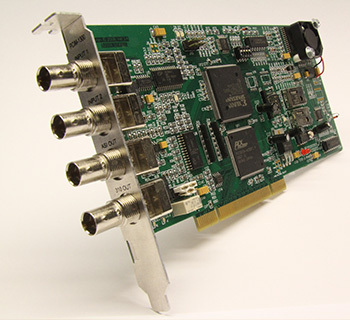 The PCIM-1300 is a real time three input MPEG multiplexer card that enables a PC to create a single MPEG transport stream output in both ASI and SMPTE 310M formats simultaneously. The two inputs can be either ASI or SMPTE-310M transport streams. The third input comes through the PCI bus which allows customized user data insertion. Complete APIs features accurate bit rate control, PID filtering, null packet insertion, and many more. Bypass relay comes standard on boards and will connect primary input to the output in the event of power failure and is format selectable. PCIM-1300 is a perfect hardware choice for low cost multiplexer solution with additional path for data insertion which allows any types of user data. When used with DTV Innovations PSIP Pro dynamic electronic program guide software application (Optional), the PCIM-1300 allows for PSIP insertion.